When I travel, I usually cut down on day-to-day expenses in more expensive locations by packing trail mix and bars in bulk, and I can usually get away with almost exclusively living on that for at least a couple of weeks. Coffee can be a different story, though. If coffee is part of your daily ritual, and if you care about good coffee, that's usually one thing that has to be found on-location. I should probably qualify this review by saying up front that I've been preferring bullet coffee lately, so my evaluation of available options leaned more toward that variety. Still, my general ratings took the overall experience into account: coffee quality, service, environment, etc. Personally, my favorite spot was The Sunrise Shack in Sunset Beach, which only does bullet coffee. If you're looking for a true espresso bar, however, I think Brew & Foam in Waialua is the best. Read below for the complete review. 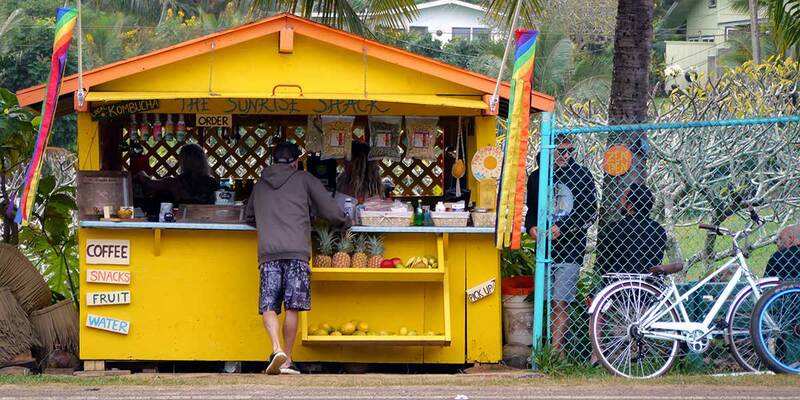 The Sunrise Shack was my personal favorite coffee spot on the North Shore. I'd often make the 15-minute drive up here from where I was staying on the east side to ground out, get charged, and sit for a while to organize my thoughts before the day got started. Initially, I had passed on this place for a long time because, honestly, it looked ghetto, and I figured the coffee couldn't be any good. Then, one day, I was with my friends Uncle Bryan and Lisa at their house, and Lisa started telling me about this stuff they had gotten from one of Laird Hamilton's companies, Laird Superfood. She was raving about the Instafuel and Cacao Creamer, specifically. I had heard of the Laird Superfood company before, but had never taken it seriously because, while Laird Hamilton himself had always been super down to earth and genuine the couple of times that I'd talked with him, the products just seemed like a gimmicky thing aimed toward a market that I didn't really identify with. But Lisa and Bryan were good people and were honestly liking the stuff, so I decided to check it out.